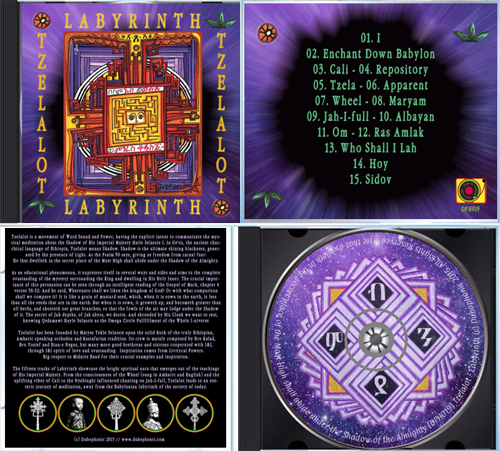 We recently decided to start printing a selection of our back catalog on "hard copies" and we are releasing on a limited edition picture CD last year's LP "Labyrinth" by Tzelalot. Founded by Matyas Tekle Selassie upon the solid Rock of the truly Ethiopian, Amharic speaking orthodox and Rastafarian tradition, the mystical vibrations of Tzelalot keep on shining bright in the darkness of Babylon. Fifteen tunes of highest meditation composed by Tzelalot, with the participation of many brethrens and sistrens, through I&I spirit of love and ovastanding. Inspiration comes from Livitycal Powers. Big respect every time Midnite Band for their crucial examples and inspiration. The CD is available online for a limited time. Blessings and love to everybody, Guidance and Itection.